Does Your Homeowners Insurance Cover Winter Damage? Home/Uncategorized/Does Your Homeowners Insurance Cover Winter Damage? Winter has arrived, and snowstorms and ice storms are already entering the forecast. Make sure you are as prepared as possible! You probably already know to stock up on food and collect blankets and other items to keep warm in the event of a snowstorm, but how prepared are you with your winter homeowners insurance? Here are some things you should check and make sure you’re covered for in case your home is damaged in a storm this winter. There doesn’t have to be a storm for your pipes to freeze and burst. If the temperature outside is cold enough, your pipes could get damaged. Make sure your insurance covers water damage, and if you leave your home for a few days for the holidays, don’t turn your heat down too much. Keeping the house temperature warm can help prevent pipes from bursting. Heavy ice and wind can do a lot of damage to trees, and you should make sure that your insurance covers damage to your house (you should also make sure your car insurance covers any damage to your car from falling trees). See what your insurance says about trees falling from your neighbors’ yards onto your home and what it says about your trees falling on a neighbor’s home. Falling trees aren’t the only thing that can damage a house. If there is heavy ice or snow, it can pile up on your roof and cause leaks or a collapse. Make sure your insurance covers the damage to your home and your furnishings in case your roof gets damaged in a winter storm. You may also need coverage for expenses like hotel bills if the damage is so bad that you have to temporarily move out. Winter storms can be unpredictable, but there are some ways you can help prevent damage and injuries. You can trim back tree branches or remove weak trees, keep your gutters clean to prevent ice from building up, salt your driveway and pathways to prevent slipping, and keep your house reasonably warm to help stop pipes from freezing. If you have questions about your winter homeowners insurance coverage or want to learn about our insurance policies, contact us today for a free consultation! 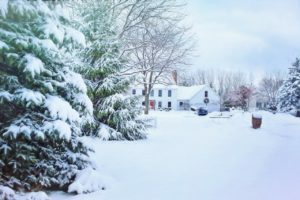 By insshops| 2018-12-14T19:17:35+00:00	December 14th, 2018|Uncategorized|Comments Off on Does Your Homeowners Insurance Cover Winter Damage?